I’ve been wanting to try rolling dice to generate a stitch pattern for a while, using my secret code techniques for the layout, and so this étude is a try at that. I think it worked out well. Here’s a free knitting stitch pattern for you! I rolled the numbers 3, 6, 6, 2, 5, and 4. I was very careful about where I placed my decreases – I like to be able to see their lines as a pattern of their own, I included a two stitch cable (also known as a traveling stitch) in the first row to enhance the effect. I also felt free to place corresponding decreases on row 9 for two of the increases on row 11, since this isn’t actually a secret code. A Roll of the Dice is a multiple of 6 stitches and 12 rows. Row 3: K2tog, yo, k2, yo, ssk. Row 5: Yo, k1, k2tog, ssk, k1, yo. Row 7: k1, k2tog, yo x 2, ssk, k1. Row 8: P2, k1, p3. Row 10: p1, k1, p2. Row 12: k1, p3, k1, p1. Here is the stitch map for this pattern on Stitch-maps.com, and here is a stitch map PDF you can print (I’d recommend getting your software to resize it to your paper). 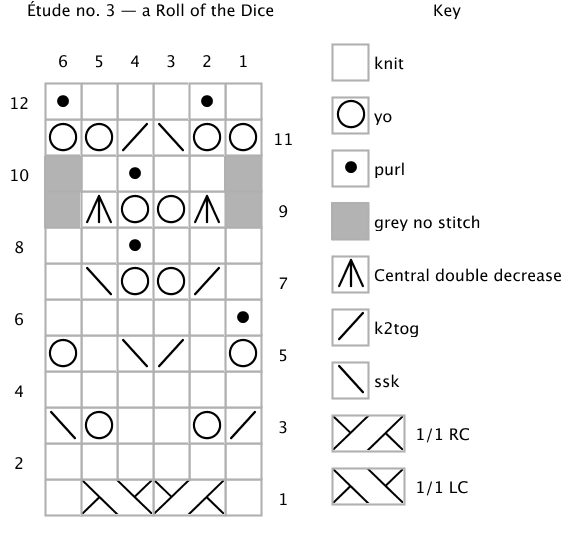 knitting stitch pattern: a Roll of the Dice by Naomi Parkhurst is licensed under a Creative Commons Attribution 4.0 International License. The sample knit up beautifully. Heh, what a cool idea 🙂 Do you think you’ll work it into a bigger design?